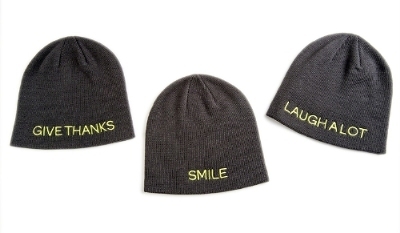 I like knit caps and I cannot lie ... What's probably the last lid of 2015 is a gray, 100% acrylic, made-in-China knit cap with all-caps embroidery that reads (nay, commands) "LAUGH A LOT." This pate-warming cap, which was in the "elf bag" my sainted mother gave me this Christmas, (other items included a pink flamingo dish and matching cheese knife and a vintage GEM single-edge razor), also happens to be heart-warming. That's because it's one of the toques in Kmart's Giving Hat program, which donates $1 from the sale of each $5 cap to St. Jude Children's Research Hospital. Other embroidered messages (all of them inspired by St Jude patients and their families) include: "SMILE" and "GIVE THANKS." According to Kmart's website -- where the hats are still available for purchase (hint, hint) -- the retailer is donating $1 for each hat sold between November 8 and December 31 with a minimum donation of $50,000. I'm smiling, giving thanks and laughing a lot since the only thing I like better than a hat is a hat with a charitable element to it. A sincere tip o' the hat to my mother -- unless she wasn't joking and really did use that vintage razor on her legs before gifting it to me. Q: OK, fun hat but what is -- or was -- Project Cubbins, exactly? A: Project Cubbins started as one man’s attempt to pay homage to Dr. Seuss and his second book, "The 500 Hats of Bartholemew Cubbins," during its 75th anniversary year in 2013. 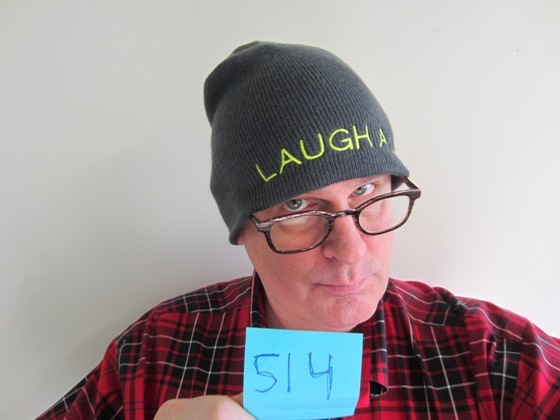 It documented the wearing of a different hat or piece of headgear every day for 500 consecutive days with no do-aheads, no banking of hats and no retroactive entries. Hat One was posted on May 27, 2013, and Hat 500 was posted on October 8, 2014. While headgear is no longer posted on a daily basis, the occasional cap, hat or bonnet – if deemed worthy and non-duplicative – is sported here for the amusement of all. 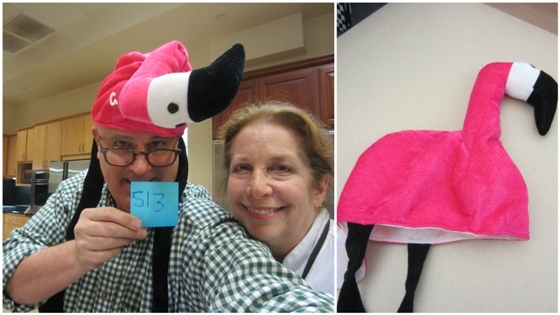 Pink flamingo hat with dangling black legs and white and black beak detail. Interior tag reads: "Made in China." This hat was at the very bottom of a large bag 'o hats that swooped into my cubicle less than five minutes ago in the hands of the Times' Test Kitchen Director Noelle Carter and Recipe Tester Davis Alexander. Davis (pictured with me in the above left photo). Davis had just given them to Noelle (well-known around the office as a headgear enthusiast) and says of their provenance: "They belonged to my mother -- the late Alice Blue Nadler." Alexander went on to explain that her mother, who passed away three weeks ago at the age of 88, simply loved to buy the fantastical hats. As the two walked away from my desk, I heard Alexander say: "It's so nice to spread her joy" -- and I vigorously nod my flamingo-topped head in agreement. What really gets my heart cockles toasty warm is that this serendipitous hat came into my temporary custody on the very sane day my own mother is celebrating her birthday -- and that my mom and I have had a long-running mutual bemusement with all things pink flamingo that began decades ago with the gifting of a plastic and wire yard-ornament version. My mom is fond of saying "you don't take the journey -- the journey takes you," and, in this case I didn't choose my Monday millinery -- and Happy Birthday -- blog post as much at seems to have chosen me. A Happy Birthday to my sainted mother Nancy Tschorn and a sincere tip o' the hat to the late great Alice Blue Nadler - with the assist to Davis. Fuzzy "Abominable Snowmonster of the North" hat with white polyester microfleece lining, gray knit acrylic (front) and polyester (back) shell, with gray and white face details in a combination of embroidery and appliques. Additional details include gray microfleece horns and interior tag that indicates it was made in China. This snuggly warm toddler-sized piece of headgear wandered past my cubicle this morning atop the head of fellow hat enthusiast (and frequent contributor to Project Cubbins) Noelle Carter and it pushed all my holiday nostalgia buttons so perfectly I had to stop down and post it immediately. If you're of a certain age you'll likely remember the Abominable Snowmonster of the North (aka Bumble) from his role in the 1964 Rankin/Bass animated holiday special "Rudolph the Red-Nosed Reindeer." If you're not familiar with this particular yeti yet, I implore you to watch (or record for later watching) one of the upcoming airings of the perennial Christmas-tide favorite. The hat tip goes to Noelle who tells me her partner Val came home with said lid yesterday.